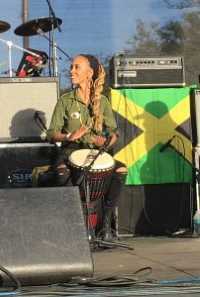 Since moving to Jamaica from Australia in 2014, Nattali Rize has taken the reggae world by storm. Already Rize has worked with many of the industry’s biggest names; an activist by nature—and experience—everything about Rize’s music and revolutionary, rebel style (or “frequencies,” as she calls them), resonates with conscious, roots reggae music, and vice versa. On February 11, 2018, Rize delivered a soulful, spellbinding performance before a motley but mellow crowd of thousands in Long Beach, California, at the One Love Cali Reggae Festival. When she was done, she gregariously walked off of the stage into the crowd to sign autographs, take pictures, and otherwise greet her many enthusiastic, adoring fans. Afterwards, the songstress generously spoke with me backstage for approximately half an hour. The many topics we discussed included: the approaching one-year anniversary of the release of her first full-length solo album “Rebel Frequency;” some of the challenges of being a touring reggae band; the brutal occupation of West Papua by Indonesia and the Free West Papua movement; the infancy of her musical career “busking” on the streets of Byron Bay and the level of support for reggae music in Australia; the status of her band Blue King Brown; the decision to film the official video for her song “Warriors” at a sacred place for Rastas in Jamaica called “Pinnacle;” and finally, what it was like to record at Bob Marley’s Tuff Gong Studios. What follows is a transcription of the interview, modified only slightly for clarity and space considerations. Q: Thank you for taking the time. That was such a high energy, soulful performance you gave today – thank you! Q: Next month will mark a full year since the release of “Rebel Frequency,” your first full-length solo album. Can you believe it’s been almost a year? Nattali Rize: No, the year’s gone fast. But it’ll be a year in May, actually. Nattali Rize: Yeah. The whole album came out in May. Q: I see. So, part of it came out in March; is that right? I thought you’d released it in March? Nattali Rize: It’s coming up, anyway. Yeah, this year’s gone so fast. We were touring at this time last year with Tribal Seeds and Raging Fyah and it’s already been a year. That’s crazy! Q: Are you satisfied with how people have received this first album of yours? Nattali Rize: Yeah man. It’s been really well-received. Q: I’m a big fan. Q: And many other people are too. Nattali Rize: It’s had a great reception on an international level. As you know there’s great support for reggae here in America. And also in Europe. And also in Japan. It’s been really well-received. Q: Looking back at this last year, as you’ve been touring [all over the world to promote “Rebel Frequency”] what has been the most difficult or challenging part of the experience? Nattali Rize: You know, it’s the lifestyle we choose. So yeah, there’s challenges. Organizing and coordinating an international band. We’re five people from Jamaica and Australia, and there’s a lot of logistics and a lot of details. It takes a lot of time and energy to coordinate and for everyone to be able to travel. Especially when Jamaicans need visas for every country in the world. Q: And it’s gotten harder these days to [obtain] those kind of documents? Nattali Rize: It’s just a process. And it’s expensive. And racist. And just an unjust process. So those are our hurdles. Having to find the money to just come and play music – even here in America; we’re here for one show, you know? So, it’s not easy. We’re independent. We have a message and a vibration to share. And there’s nothing else we can do with our lives, because we’re here for this reason. The journey does have some ups and downs and we just [have] to power through it, connect and resonate with the communities that embrace this music – like this festival. This festival is amazing! There’s so much love for reggae right here. And I didn’t even realize how big this festival was! Nattali Rize: Yeah. So you can really see the power it has. And the crowd was so open-hearted and energetic, and responsive – it makes it all worth it. Q: For sure. Now, I know you were born in San Diego [California, USA]. Is that right? Q: And how is it you wound up moving to Australia? Nattali Rize: My mother – well, I grew up in New Zealand and Australia. So when [my mother] and my dad – they actually met over there – and then they came over here, and then we moved back. Q: An article published in July of 2015 in the Saturday Paper in Australia said that your mother is a “Samoan who worked with an indigenous organization.” Can you say more about that? What was that organization, and was it involved with the Free West Papua movement which I know you’re involved with? Nattali Rize: Yeah, so, my mother’s heritage is predominately Samoan. Which is a Pacific island off of the east coast of Australia. And growing up she worked with numerous community groups and the government branch for indigenous affairs. So, growing up my family and my extended family were indigenous Australians from different parts of the country. Australia is very diverse in its indigenous population. Before there were white man’s borders there, there were over 250 countries with all different dialects – within Australia. Now when you refer to West Papua, West Papua is an island of off the northeastern tip of Australia. And it’s the western half of an island of New Guinea; the eastern half is Papua New Guinea, which a lot of people have heard of. And then, West Papua, a lot of people have never heard of. It’s been colonized first by the Dutch and [then it was] invaded by Indonesia. And ever since then, it’s been over 60 years of a brutal, militant occupation. And the reason you would have found that in conjunction with my name is because we work with the West Papua community to help raise awareness. To shine a light on the daily injustices that are happening in West Papua today. And the type of colonial regime, and all the brutality, all the fuc*ery that happened in Australia years ago, [and] that happened in America, is happening now to the indigenous people of West Papua. By Indonesia. So, yeah, it’s an issue that’s very close to my heart because my sistren who sing with us in Australia are West Papuan. Q: Rumwaropen [is their last name]? Nattali Rize: Yeah. Their first names are Lea and Petra. They are two of the daughters of one of the most prolific and famous musicians out of Melanesia, which are the islands that include West Papua. They were called “The Black Brothers.” And they had to flee West Papua because they sang songs of freedom. And Lea and Petra are two of the three sisters that carry on the legacy. And we’re honored to have them perform with us, and share their message. And quite often, in different parts of the world, people will come to a Nattali Rize show and bring a West Papua flag. In fact, today, I was wearing a West Papua flag badge on my shirt. Q: Yes, I saw that.Now you’ve spoken before about your early musical career [in Australia]. [Even] before you were (1) in the band “Skin” with percussionist Michael Sheehan, (2) before [you founded the band] Blue King Brown, and (3) before Carlos Santana invited you on stage at one of his shows and handed you his guitar to play in front of a crowd of 15,000 screaming people. You’ve often described “busking” in the streets of Byron Bay during your high school years [in Australia] with your partner and manager, Carlo “One Rebel” Santone. And I wondered whether you were getting in trouble? Q: (Laughing) Yeah. You know, whether your mom knew? And whether she approved? Or maybe you were getting in trouble because you were missing school? Nattali Rize: (Laughing) No, my mother’s always been very supportive of whatever direction, especially creative, that I’ve chosen. In fact, she was my first guitar teacher, and the reason I fell in love with guitar. And making music on the streets was just the foundation of my experience becoming an artist. I learned so much about being an independent musician by playing on the streets. You literally have to make your own concert time. Promote yourself. You have to be entertaining enough that people will stop. And then, even more entertaining, [so] that they will stay. And then even more entertaining, [so] that they will give you money, you know? As busking goes. To be able to pull that off is a real skill. And it’s a great way for musicians to cut their teeth, so to speak. And get their stage skills up. Because when you’re on the street everyone is equal, everyone’s on the same level. And that’s the kind of vibration that I love because it’s also kind of renegade. We just roll up into a place and play our drums. Wow! And people feel it. It’s not like noise pollution. It’s like we’re generating a collective energy; we are co-creating this energy in that given moment. And that’s why music is so powerful. And that’s the same experience that happens when you get on the stage as well. It’s a different branch of that. Q: You’ve said before there’s not a lot of support for reggae music in Australia. I was kind of surprised to learn that. Are there any particular reasons for why you think that is? Nattali Rize: You know, I just, I think it’s got to do with . . . don’t get me wrong. There’s a lot of love for reggae there. And we have such a great Islander community. Like my mother comes from Samoa, we have a huge Tongan community, and all the islands around [Australia] love reggae. And New Zealand of course is close by where you can hear number one reggae songs on the radio. Australia, I don’t know why. Our population is small compared to somewhere like America. But also I think it’s access. I don’t think people have access to all the incredible new reggae that’s come out within the past six years. Everyone knows who Bob Marley and Jimmy Cliff are for sure. And Bob’s sons. They all do great over there. But we’re not seeing as many of the next generation of artists come over. But they will. It is slowly picking up. Q: A somewhat related question: I know that you have relocated to Kingston, and that you’ve been in Jamaica for about four years now. Is that right? Nattali Rize: Yeah, I’ve been in and out of Jamaica for the last four years. Q: I know you’ve been touring a lot, but your home base is in Kingston now? Nattali Rize: You know my home base is wherever my feet are planted on the ground. Q: Fair enough, but could you ever see yourself moving back to Australia permanently? Nattali Rize: I would never say never. You know Australia has the most incredible beaches, the most beautiful environment. And of course I have family there. So it’s not like a place I will never go visit. I was there recently for Christmas and it was great. Will I live there [again]? I don’t see that in the near future. But I would never say never. Who knows? Q: Before moving from Australia to Kingston and hooking up with [well-known production team] Notis [Heavyweight Rockaz], the world mostly knew you as the lead singer for Blue King Brown. Q: And I know that even as recently as 2015, that [Blue King Brown] released “Born Free,” your third studio album with the legendary rhythm and production duo Sly and Robbie. Is Blue King Brown still alive? Are you still performing with them now that you have this solo project you’ve embarked on? Nattali Rize: (Laughing) Yes. Blue King Brown is definitely still alive. It’s such a well-loved band in Australia and all parts of the world. For sure a lot of energy has been shifted towards this [solo] project since it started. But we’ve just been discussing some more movement with Blue King Brown. Q: I know you’ve been asked this question before, a few years ago, and you resoundingly said just like you did today that Blue King Brown was still alive. And I just wondered, because I see your talent exploding in this different direction, this [solo] project, and I wondered if at some point, just realistically, whether the demands on your time and the pressures on you will be such that you’ll have to make a decision whether you can do both projects? Nattali Rize: Yeah, well it’s never really like that, you know. You do what you want to do and you just try and work around what’s happening. And that’s how it goes. Blue King Brown is a really important band in terms of having a really strong voice for Australia. And one of the most conscious voices [for] a band with a longstanding fan base. So we definitely have to keep servicing that. Q: You just recently released an official video for your song “Warriors” off of your album Rebel Frequency. It’s a stunning video you filmed at a very sacred place for Rastas in Jamaica called “Pinnacle.” And the video features [filmmaker, activist, and] granddaughter of Bob Marley, Donisha Prendergast. Could you explain why you “livicated” the song “Warriors” to the “Occupy Pinnacle” movement? And also, how the Rasta community of Pinnacle, fits with the message of your [solo] album? Nattali Rize: For sure. You know we had heard about Pinnacle for some years because Sister Donisha is doing some great work trying to raise awareness about these acres [of land] not far from Kingston town where a once thriving sovereign community existed. [It was] started by a man named Leonard P. Howell. And he’s considered the “first Rasta.” He basically started a community that was up to, I believe, 5,000 people strong. And they had their own food. Their own bakeries. Their own systems running at a time when people were just coming out of slavery. So, ultimately, to make a long story short, the [Jamaican] government shut it down. And it has been slowly but surely chipping away at these 500 acres [of land], right? And the peak of these acres is called Pinnacle; it’s a 360-degree view. You can see it in the video – it’s stunning. It’s amazing. And right now today, Rastafari are fighting to get their land back. If not the land that has already been sold-off and occupied by other people, then to give those acres to them somewhere else. And still have spaces, safe places for Rastafari to practice [their religion], and just live, and you know, just to keep that culture alive. The reason why it fits in with what we’re doing is because this project was basically born out of Jamaica. You know, “Nattali Rize” kind of started in Jamaica. Even though I’m not from there. That’s where my heart led me. It’s where my intuition led me. Because I’ve loved reggae for so long. So making those connections and already being someone who’s thinking in terms of sovereignty, and freedom, [the] Occupy Pinnacle [movement] resonated with me. And then, also having someone like Donisha, who is such a great leader, and spokesperson, and articulator of the cause, really just brought it in. And actually the Warriors video, to be honest, it was never planned to be filmed there. But we were going for a “working bee,” me and a couple of other members of the band. We just went to be part of one of their working bees to help plants seeds, do some farming. Literally get our hands dirty and just give some energy to Pinnacle. And what happened is, we just started filming and getting some shots, and we were [thinking] yeah, this could work. And Donisha was like, “yeah, I’m into it.” So it grew from there. And those things are always nice the way it naturally flows. And any energy we can give to raising awareness about Pinnacle, we’re humbled and honored to be able to do that. Q: As your music has evolved [with your move to Jamaica], it has, as most conscious roots reggae does, become [increasingly] steeped in and involved with Rastafari culture. Have you also, in your own spiritual growth, and as a personal matter – do you have the same beliefs as Rastas do about [His Imperial Majesty] Haile Selassie I [, the Emperor of Ethiopia from 1930-1974] – or is it more the Rastafari culture [and governing philosophy] which is also just so conscious, or is it a mixture of all of these things [that has influenced you]? Nattali Rize: I’d say it’s a mixture of those things. Because for me, my own philosophy has been inspired by and resonates very strongly with Rastafari philosophy and culture. And I recognize that has been a big influence. I mean, initially I was drawn to it through music. And I think that it’s just so important, and such a treasure for the planet to have this positive music seep through every vein of every village of every town. This positive philosophy of one love and unity. And no one can deny that that has come from Rasta. And that has come from reggae music. So, yeah, for me, I’m an evolving being – like everyone else, with an evolving consciousness – I’m open to learning, and listening, and experiencing different things. You know? Q: You’ve talked before in the past about how special it was to record at Bob Marley’s Tuff Gong Studios in Kingston. And you’ve talked about how [Bob’s] instruments are there; his piano is there. People who used to work with Bob are there. How it’s just such a special place. But I also wondered if you [could] demystify it also, just a little bit – particularly for musicians who might read this interview. I mean, even though you have such [great] connections – I mean almost all the contemporary musicians in Jamaica want to work with you; they’ve either already worked with you, or [they] are trying to work with you – when you go into Tuff Gong Studios to record something, can you speak a little bit about how much work is done before[hand]? I mean, it’s not as if you just go in there and wait for the inspiration to hit you, right? Because it’s a studio, where time is money. And people are moving fast. Nattali Rize: Well, it’s the same as any studio, you know? You prepare yourself to get [the] musicians together, and then, we head in. And Jamaicans are fast. They will learn a song, hear it once, and play it good. (Laughing). From our experience, walking into Tuff Gong, off course we’ve got the session, the idea of what we want to do in our head. And then, because Jamaicans are so quick, sometimes we’ve had the opportunity to just try a couple of ideas, and get some extra bars recorded. But there is something about Tuff Gong in that, it’s a comfortable space. It has a great vibe. And a lot of musicians work there. So [it’s] very familiar [to us]. We can really get in there and feel very at home, very quickly. Q: You’ve worked with some of the top people in the reggae music industry already. Despite having just [arrived] in Kingston in 2014, you’ve worked with: Sly and Robbie, Raging Fyah, Jah9, Kabaka Pyramid, and many more people I could name. And I’ve heard you say before that “music is a mission, not a competition.” Is that just something that you say, or is that a saying [in Jamaica]? Nattali Rize: (Laughing.) That’s a saying. Q: Because you’ve had all these opportunities, and you’ve worked at Tuff Gong and had all these great collaborations. [So,] I wondered whether anyone so far in this industry, or in Jamaica [period] has, for a lack of a better way to put it, given you a “stink eye,” and been envious or jealous of these opportunities you’ve had? Nattali Rize: No, no. It doesn’t work like that. People don’t think like that. Nattali Rize: Yeah. Very welcoming. Very welcoming. With the right intentions, and the right heart, and the right mission, we are all one people. All one family. Jamaica has really embraced the energy of the [Nattali Rize] project, and it’s been positive. Q: Along the same lines of difficulties in the [reggae music] industry, it has often been observed that reggae is male-dominated. Of course, there are plenty of very talented female artists in reggae music [and there always have been]. But, as you may know, in the United States, there has been this movement, this “me too” movement, [concerning the] sexual harassment of women. And because I believe you are one of the most talented women right now in reggae music, I wanted to ask whether you have ever had to deal with the issue of sexual harassment in the music industry? Q: I’m glad to hear it. Now I want to ask you something about this year’s Grammy awards. After a series of musicians performed, they went on stage and read from [Michael Wolff’s “Fire and Fury”] a book critical of President Trump and his administration. And Nikki Haley, the United States’s Ambassador to the United Nations wrote on Twitter: “I have always loved the Grammys but for artists to read the Fire and Fury book killed it. Don’t ruin great music with trash. Some of us love music without the politics thrown in it.” What’s your reaction to that? Nattali Rize: It’s complete fuckery. People should say exactly [how] they feel, when they feel [it]. And of course, a platform like that, at a stage, at anywhere where you give somebody a microphone – in these times!? It’s a responsibility to say something, you know what I mean? And it’s not just about going and saying something. It’s about using our actions, and our words, and our daily choices to vote. It’s not about voting every election. Because, it doesn’t matter. This version of democracy is fake. It’s not real. It doesn’t serve people. [And] it never will. Because its foundation is capitalism: it’s about competition and money. But we’re trying to unite people. Music is trying to unify and get rid of the ego. And get rid of the competition. So, of course we are going to sing about and say these things. And in these times? Yes. Speak. Please! I see someone on the stage like that saying something [and] I’m like, great, thank you for saying what probably a lot of what your country is thinking and feeling. It’s a responsibility.